Every four years, two children are kidnapped from the village of Gavaldom. Legend has it these lost children are sent to the School of Good and Evil. the fabled institution where they become fairytale heroes or villains….. I was lucky enough to be sent the first book, The School of Good And Evil and the second upcoming release, The School of Good And Evil, A World Without Princes by Soman Chainani for my eldest daughter Elise to read and review. The first story takes two girls named Sophie and Agatha to the school for good and evil. The good girl, Sophie was put in the evil school and the bad girl, Agatha was put in the good school. The story shows them finding out just how they get out, and it turns out that they have to solve a riddle. I loved reading all the adventures they have, especially the humorous ones. As an example, when a pumpkin explodes over Tedros and Sophie, very funny!! In the end the girls work out the answer to the riddle, and the answer is love. But an even bigger twist is that it is Agatha's kiss to Sophie which shows the love. At the end the girls think they are free to live their happily ever after but are they? The second book clears the road to the school of good and evil once again, Agatha is missing Tedros and one moment of weakness, Agatha makes a wish which has Sophie and Agatha sucked back into the world which they got away from but just from the first few pages, you notice that some things have changed. I have just started reading it and I am very excited to find out what happens next to the girls. I also read these books. I loved how the leads are both strong female characters, one who longs to be a princess and one who really just wants to go home. And although there is a love story in the first book, Soman has put a twist on the traditional fairytale and made the stories more about friendship. I think both books did a great job in making you think about just what makes you good or evil, showed that things aren't so black and white. The writing flows well and at the start of eah chapter is a beautiful illustration, giving your imagination a little nudge. Filled with drama, twist and turns, laughter and much much more, even I can't wait for the third book in the trilogy. The School For Good And Evil, A World Without Princes can be purchased as hardback from amazon now and will be available as a kindle edition and paperback on the 8th of May!! You can watch the book trailer below. 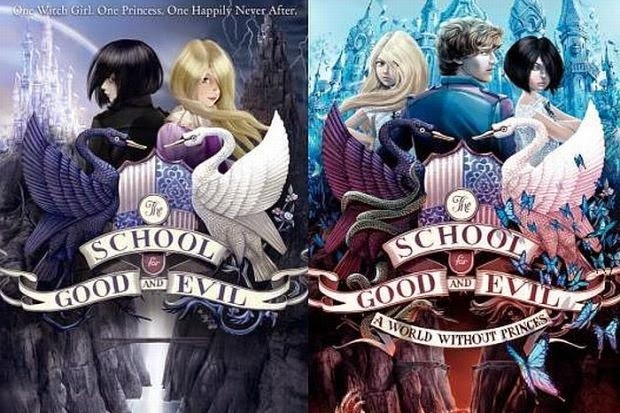 Now do you fancy getting your hands on a copy of The School of Good And Evil, A World Without Princes?? All you need to do is fill out the rafflecopter form below. The giveaway is open to UK residents only and will finish at 11.59pm on the 25th of May 2014. Make sure to fill in the form correctly as all entries will be checked and verified, good luck. I have just finished reading Victoria Hislop's The Island and I am about to start her next book The Return! The last book i read was The Hunger Games (book1 of the trilogy) by Suzanna Collins!! The Thirteenth Tale. Fantastic book. Ah this isn't a book which would appeal to us at the mo (I'm too old, they're too young) but it looks like a fun series! I'm just half way through 'Don't let me go' by Susan Lewis. My Madder, Fatter Diary by Rae Earl! This is the last book I read too! I thought it was brilliant! Vanished by Tim Weaver, very good!